Bonus - Get a FREE 2oz sample of our popular ZA-HA Jordanian Dry Zaatar Seasoning Blend with your purchase of ZA-HA Zaatar Spread! 100% money back guarantee! If ZA-HA Zaatar Spread isn't better than you expected, we'll give you a 100% refund, including your shipping costs! 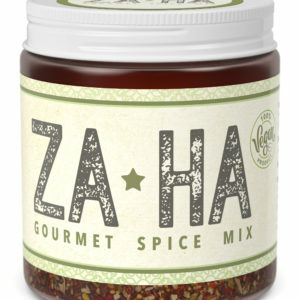 Our unique, award-winning zaatar oil & spice blend condiment offers deep, rich flavors of roasted garlic, thyme, oregano, roasted sesame, olive oil, and other subtle spices and herbs that leaves you wanting more. Perfect for spreading on breads, meats, pastas, and almost any other type of meal. Use as a condiment on sandwiches and burgers for a whole new flavor that you've never tasted before. 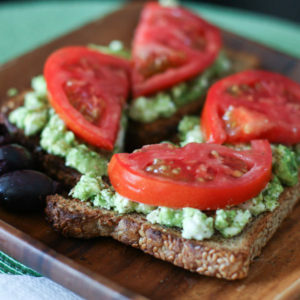 Add to breakfast to turn bland, into incredible! Every Za-Ha product comes with a 100% money back satisfaction guarantee. If you don't absolutely love it, we'll refund your purchase, including shipping. This 4 ounce jar of Zatar will fulfill your friends and family's desire for this spice, rich in history and deep in heritage. The perfect size for all chefs in every kitchen. 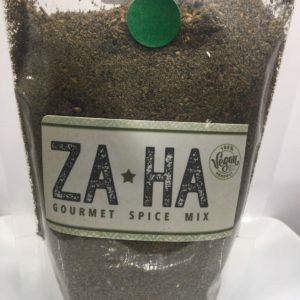 Introducing Za-HA's special Jordanian zaatar blend, which includes delicious flavors of thyme, sesame, roasted wheat, coriander seeds, anise seeds, salt, and chili. 100% all natural. All Za-Ha products are free from preservatives, MSG, and fillers. Sprinkle on breads, pizza dough, meat, or pasta to instantly give an amazing boost to your favorite meals. Bring your meals from "good," to "amazing," only with Za-Ha zaatar.